To mark the 35th anniversary of his Joy Division bandmate Ian Curtis’s death, Peter Hook says he’ll stage a one-off concert with his band, the Light, during which they’ll play every single song ever recorded by the seminal post-punk outfit. Titled So This is Permanence, the event will take place at Christ Church, an 18th-century landmark no longer used for worship, in Macclesfield, England — Curtis’s hometown — on May 18, the same date the singer committed suicide at the age of 23. Proceeds will be donated to the Royal Epilepsy, the illness from which Curtis suffered. Three and a half decades after Curtis’s passing — which led to Joy Division’s dissolution and the formation of New Order by its surviving members — Hook still has a home nearby. In fact, his daughter now attends the same Macclesfield school that Curtis once did (although Hook says Curtis was expelled). “I drive her there every day, and I [think about] Ian every day,” he says. Reached by phone at home in the north of England, where he’s hard at work on his third memoir, Power, Corruption, and Lies: Inside New Order, set to be published this fall (“I’m just now working on the Monaco chapter,” he says), the iconic bassist affectionately known as Hooky reminisces with Yahoo Music about Curtis and why he’s committed to playing Joy Division’s music to audiences around the world today with the Light. YAHOO MUSIC: I seem to recall [Joy Division and New Order co-founder] Bernard Sumner once saying something to the effect of May 18 not being a day to be celebrated. Why do you want to commemorate the day of Ian’s death? PETER HOOK: I prefer to think of it as celebrating his life. And I’m celebrating the very untimely end of what was our dreams and hopes then. It’s not about celebrating the bad part. Bernard seems to have gotten stuck in this thing where he criticizes everything. Like, Ian’s house here [in Macclesfield, where he died] was for sale, and someone was going to buy it and make it a museum. And Bernard says, “Oh, it’s terrible.” He thinks it’s terrible because it’s celebrating suicide. It isn’t, is it? It’s celebrating what he did before the illness affected him so much that it colored his judgment. You’re celebrating his fantastic music, his fantastic lyrics, his fantastic legacy and heritage that he left for everybody to enjoy. It’s something I think to be proud of. But Bernard and I generally don’t agree, do we? It’s something that makes our relationship so interesting. You didn’t play much Joy Division music live when you and Bernard were together in New Order. In fact, for years you didn’t play any. You see, when we were together as New Order, it felt OK to ignore everything to do with Joy Division. We focused on New Order, and, against all the odds, we made New Order an international success. We didn’t dabble in anything to do with Joy Division. Once we split up, and I was on the outside looking in, it struck me as a little odd that we never celebrated anything to do with Joy Division. Nothing. Not year one all the way through to 30. It just seemed weird. Now you play a Joy Division set every night while touring the world with the Light. I think Ian would be very, very proud of us doing it. Because Ian’s dream was to take Joy Division to the world. It was only his illness that robbed him of it, and robbed us of it, and robbed his family of a father, etc. The whole reason I started playing again [after leaving New Order] was to celebrate Ian’s 30th [death] anniversary [in 2010]. 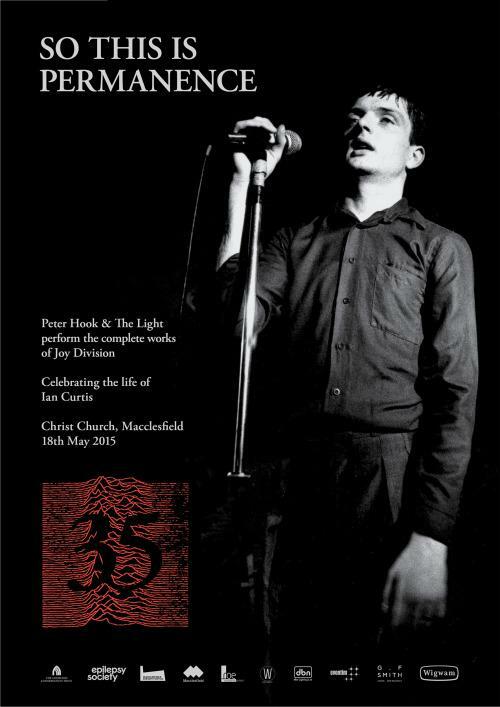 The idea of us getting together as the Light — well, we weren’t even the Light yet then; we became the Light so we’d have something to put on the poster — was to play the music of Joy Division for one night at the Factory [in Manchester, England] which grew to two nights, and then we started getting offers to play everywhere. We’ve been to some amazing places playing Joy Division. ‘Cause Joy Division never got anywhere in their three years together, just six months professional. We never got to America. There were so few places that Joy Division actually played, and then for [the Light] to get to Brazil, Mexico, Argentina, America, Australia, New Zealand… [I thought] it would be full of old blokes like me celebrating it, and yet the audience is very young — in Mexico, it was amazing! The fact that Joy Division’s music has spanned decades since Ian’s untimely demise, it’s such a compliment to all the members of Joy Division. For this event in Macclesfield, you will be playing every song that the group has ever recorded. That’s quite a marathon. How are you training? By playing 38 songs a night when we come to America [for tour dates beginning April 15]. That’s a normal show for us, so 48 isn’t that much of a stretch. We’re almost in Bruce Springsteen territory anyway. And we will play them chronologically. A music geek’s dream! Can you walk us through the setlist? The first track is “At a Later Date,” which was on the Virgin sampler [Short Circuit: Live] at the Electric Circus.” Then it’s ”An Ideal for Living.” Then it’s Earcom, the Fast sampler; then the Factory Sampler. Then it’s Unknown Pleasures; then it’s “Dead Souls” and “Atmosphere.” Then it’ll be the tracks we left off of Closer; then Closer. And then finishing with the singles, because they were always separate — so it’s a good excuse to finish with “Transmission,” “These Days,” “Love Will Tear Us Apart,” etc. Meanwhile, fans in U.S. will get to hear you play some of that when you come over next month? This tour is a Joy Division tour. So we’ll be opening as New Order, then playing the two Joy Division LPs [Unknown Pleasures and Closer]. I’ve never been able to play this many songs ever in my career. We have a library with the Light of 100 songs that we play. We play [New Order albums] Movement, Power, Corruption and Lies, Lowlife and Brotherhood, and all the tracks in between, plus all of the Joy Division catalog. I’m hoping it will keep Alzheimer’s away, you see. Before you go: What are your top three favorite Joy Division songs? The ones that I’ve enjoyed [playing] the most generally have always come from Closer, because we played Closer the least. When I think how frustrating it must have been, and how sad it was for all of us to finish such a wonderful record and not play it… [Curtis committed suicide two months before the album’s release.] So my top three at the moment would be “Decades,” “The Eternal,” and “Passover.” It’s a time for reflection. via Peter Hook Discusses Playing Entire Joy Division Catalog on Anniversary of Ian Curtis’s Death. Absolutely – not sure when I’ll be there yet – I’ll message you via Twitter!